WrisTimer PM - Wrist Support provides therapeutic treatment at night. 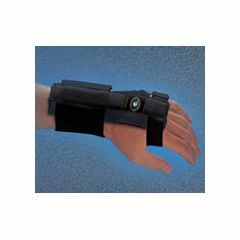 Dorsal application allows a comfortable fit and prevents flexion of the wrist. The aluminum stay holds the wrist in a neutral position to reduce inflammation and provides support following surgery. WrisTimer PM maintains a neutral wrist positioning during sleep. Research studies show maintaining a neutral position during sleep provides optimum relief and treatment of RSI symptoms. Use for repetitive stress injuries, post-op rehab, carpal tunnel syndrome and improving patient compliance at night. WrisTimer is the perfect companion for wear during the day. comfortable day and night. eases pain quickly. so far havn't found any. compuuter work. overnight relief. housework. almost 70 yrs old. 35 yrs + in factory work. split firewood weekly. I received 2 of these from a friend who found them new on a garage sale. My daughter works for an attorney and is on computer all day. I felt such relief with these, I ended up giving her mine, (she loves them) and I ordered two of my own from Allegro Medical. They have helped both of us so much we are no longer discussing surgery. Stabilizes wrists. Prevents worsening pain. This hasn't cured me of the pain in my hands and wrists but once I started to wear them (many, many years ago) they stopped the pain from getting worse. I have used this wrist support every night for more than a year. Previous to that, I had begun having a tingling, numb sensation in my middle finger on my right hand. Use of this support has minimized that sensation. Doesn't this come in multiple sizes for each hand? There is no menu to select which size and which hand I want the brace for. I have tendinitis in my elbow is the wristimer a good support for this? to keep the elbow stable at night?